With our modular stackable cabinet system, the sky is the limit! Clean lines and finished end panels add a European design look to your kitchen. I was so impressed with the quality of the cabinetry. I had ordered kitchen cabinets and vanities. My contractor was equally impressed with the quality and ease of installation. Customer service is top notch. They can help customize anything you need. For example, I had a built in coffee maker that needed to be in a specific spot and location and they figured it out. Lots of variety on the finishes. Can't beat the value. Quality of the cabinets is much higher than Home Depot, my contractor was impressed with the solid plywood and the quality of the hardware (glides and trash pull-out). The online design process was fast and easy and the customer service always prompt and friendly. Highly recommended! When remodeling our mid century kitchen MOD Cabinetry was a perfect fit. At first we were a bit unsure about buying cabinets online. However when they arrived we were blown away by their high quality. We did comparative shopping before choosing MOD, and I have to say that its a very competitive price point for the quality they deliver. From designing to installing, we experienced great customer service. Welcome to Mod Cabinetry! We are THE source for high quality all USA sourced and made European Frameless cabinets online. We offer an extensive selection of cabinets that includes modern, contemporary, and transitional designs. You’ll find everything from modern white gloss kitchen cabinets to modern walnut cabinetry to contemporary painted cabinetry and everything in between. 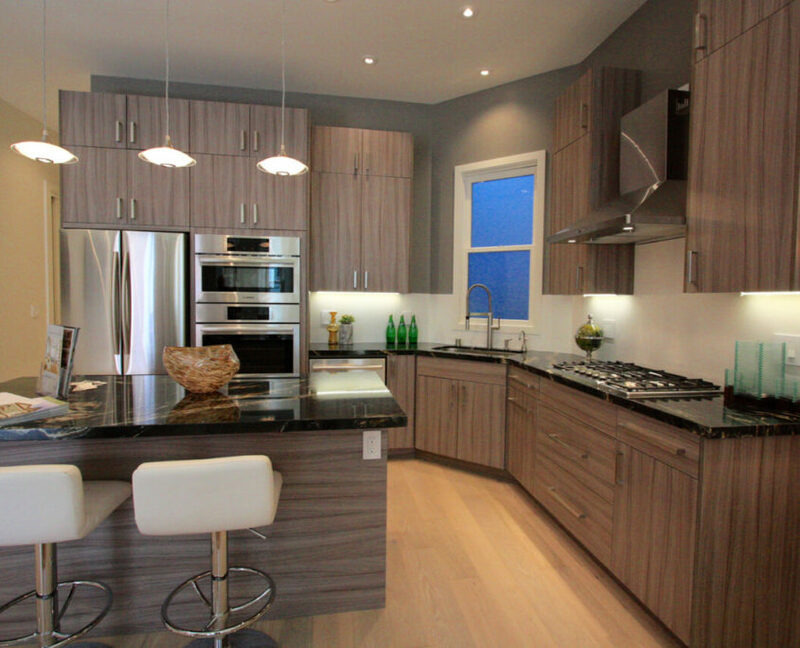 We also believe modern cabinetry is so much more than simply modern design lines. We believe that to be modern in the 21st century requires adhering to principles of environmental and social responsibility as well as using technology to revolutionize the design process. These modern ideals are at the center of everything we do. We ship your new Mod Cabinets completely built and assembled. Our US factory makes sure each cabinet is perfectly square, using dowels and screws and glues and cross-beams, none of which you get when purchasing RTA (ready to assemble) cabinetry. Buying pre-assembled kitchen cabinets make installation a breeze. Simply open the box and install, and know that your cabinetry is built to last a lifetime. We can do it all! We have the most popular modern, contemporary and transitional fronts and finishes available in the USA. Look no further than the Euro Line for sleek Roma, Modello and Curva finishes. Check out the Contempo line for modern woods such as walnut, rift oak plus contemporary favorites such as painted, cherry, alder and maple. And for the budget conscious, take a look at the Elements line for thermofoil fronts. Our professional kitchen designers rendering package is so advanced we bet you cannot tell the difference. Yes, the photo here is actually a rendering from our software! We design for you from scratch using either our curated catalog of our 65 most popular cabinets and corresponding sizes or customizable options with 1000’s of options. Buying kitchen cabinets online saves you time and money. Instead of spending hours inside a showroom trying to figure out what will look good in your space, why not shop from the comfort of your home and let our designer come up with a modern kitchen design? Already have a professional layout? We have a plan for that starting at $39! We are quite proud of our advanced online kitchen design software. See for yourself how you can layout your kitchen, select and place cabinets, add appliances and visualize it all in color renderings based on your selected finish. Enjoy being independent and design your own kitchen using our curated catalog. All of our cabinets are made right here in the USA, from cutting the casework to the handmade drawers. Let us take you on a journey through the 250,000 sq foot facility where it all happens! We love the work we do and we want you to meet the people behind it and to see for yourself some of the many steps that go into building the perfect cabinet. *Bylder By Mod Cabinetry is made in California facility with imported parts. Facility not photographed. Need a little inspiration? Check out kitchens in this slideshow How do you imagine your dream kitchen? Modern walnut? High gloss acrylic? Or clean white paint maybe? These quality and features come standard with Mod Cabinetry line. All USA sourced and made. Meet Blum Legra, our premium metal drawer box with smooth extension and maximum drawer space. USA made. Comes standard with Modello finishes. USA made and comes standard with paint, wood, Thermofoil Matte and Roma finishes. USA made and comes standard with Thermofoil standard finishes. USA made and outfitted on all Mod Cabinetry finishes. USA made and Green Guard Certified. Comes standard with paint, wood, and Thermofoil finishes. USA made and Green Guard Certified. Comes standard with Roma and Modello finished. These durable features come standard with Bylder Line. Imported components, Doors made in California and assembled in USA. Durable plywood construction made of plywood with white melamine.